Perdue Foods of Georgia is recalling about 68,244 pounds of ready-to-eat chicken nuggets because they may be contaminated with foreign materials, more specifically wood. There have been no confirmed reports of any injuries or adverse reactions to date. The problem was discovered after three consumer complaints were received by the company about the contamination. Someone also reported finding foreign materials to the USDA’S FSIS consumer complaint monitoring system. The foreign materials can pose a choking hazard, or could cause injury to the mouth. The ready-to-eat chicken nuggets were produced on October 25, 2018. 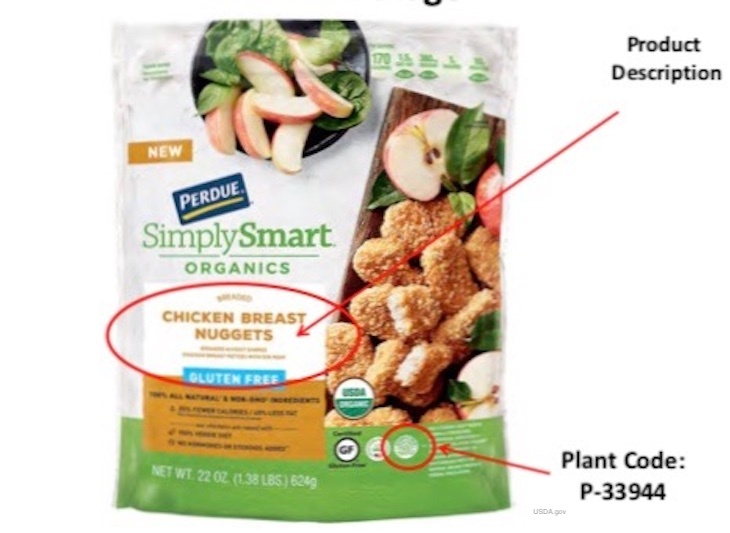 The recalled item is 22 ounce plastic bag packages of frozen “Perdue SimplySmart Organics Breaded Chicken Breast Nuggets Gluten Free.” The product has the best by date of 10/25/19 and the UPC number 72745-80656 that is printed on the label. The chicken nuggets have the establishment number “P-33944” inside the USDA mark of inspection. They were shipped to retail locations nationwide. FSIS is concerned that some of this product may be frozen in consumers’ home freezers. Check your freezer for this product. If you bought it, don’t eat it. Throw it away after first wrapping the package in foil or plastic wrap, or take it back to the store where you purchased it for a full refund. When available, FSIS will post on its website the retail distribution list of the stores that may have sold this product. FSIS is also conducting recall effectiveness checks to make sure that the firm has recalled all of these chicken nuggets and that they are no longer available for purchase.